AmeriDeck Loading System For Sale | T.P. Trailers, Inc. 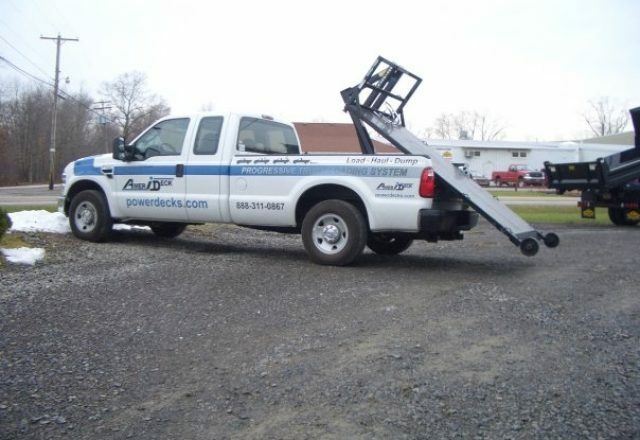 The AmeriDeck hydraulic loading system is designed to fit in a standard pickup truck bed. AmeriDeck has many detachable decks that are suited for many different hobbies and workloads. Lift up to 2,500 lbs. of equipment or materials in the bed of your truck for safe transportation, ground level loading and unloading and easy release of the detachable decks. Call today to find out more about this versatile and easy to use AmeriDeck loading system that turns your truck into a work truck! This powder coated deck has eight (8) tie-down points, secure under-deck storage and has extendable and removable landing wheels. 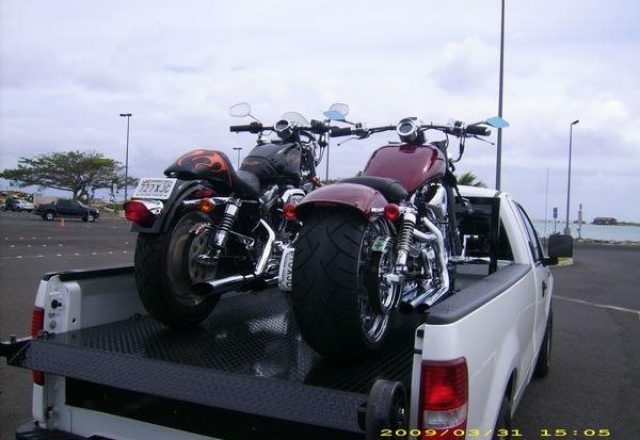 Enhance this body even more with options such as mesh sides or a deck extension for easier hauling of longer equipment or motorcycles. This detachable deck comes in 8’ and 6.5’ models and is great for hauling or delivering tools, equipment, general equipment and recreational vehicles. Call today to bring home your new SuperDeck! This great alternative to trailers, liftgates or winch-based loading systems takes the original SuperDeck to the next level. At almost five (5) feet wide and eight (8) feet long, this detachable deck is great for hauling golf carts, UTVS, ATVS, trikes and so much more. Switch detachable decks in minutes with only two pins for quick detach; the SuperDeck III is also great for loading and unloading at ground level, and decreasing risk of injury to you or your equipment. 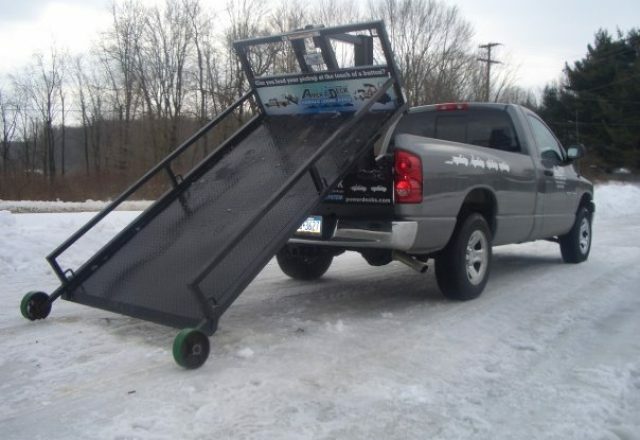 Get more versatility out of your truck today and get your new SuperDeck III! If you’re a motorcycle enthusiast, you will love this detachable deck from AmeriDeck. With the standard features of the SuperDeck and SuperDeck III, this is specifically designed for riders. Prepare for bike trips with secure under-deck storage and eight (8) tie downs. Get more out of your detachable deck with options such as deck extensions for longer bikes and trikes, high bulkhead kits and toolboxes for any last minute adjustments to your ride. Call today to find out more about this great product and add it to your truck! The truck is primarily used for wastewater pump station maintenance; pulling pumps and equipment from dry and wet well environments, however it can be used for any crane lift function. The onboard water supply allows us to pressure clean equipment at any location regardless of the availability of water, and the onboard fuel supply allows us to carry auxiliary diesel for extending on-site project operations without the need for refueling at our fuel station. The truck’s body and power lift gate is of sufficient size to provide for general equipment and materials carrying, making it a multi-use fleet vehicle. Over the last several years we have been able to streamline our fleet by custom designing greater flexibility into trucks, which includes moving toward Switch-N-Go to reduce our dependency on owning multiple low use chassis. We have incorporated the custom design of a high pressure sewer cleaning jet Switch-N-Go platform with a dump truck body using a Ford F650 to increase chassis usability. The potential for switch-n-go in the municipal sector is endless.